From learning about the importance of exercising regularly to fully understanding your arthritis medications, the information contained in this section will provide you with insights, information and tips that can be used to help make living with arthritis a little bit more manageable. Learning to make arthritis part of your life can be difficult. But understanding as much as you can about your particular type of arthritis – and actively working with your arthritis treatment team – are two very effective ways of regaining control over your life. Try not to let arthritis beat you. How? Arm yourself with as much information as possible. Learn from the experiences of others in similar circumstances. Some things may work for you one day and not the other. That’s why we’ve tried to cover several topics in the “frequently asked questions” section below. The cartilage in a joint acts as a padding that absorbs stress. The proportion of cartilage damage and synovial inflammation varies with the type and stage of arthritis. Usually the pain felt in early stages is due to inflammation. In the later stages when the cartilage is worn away, most of the pain comes from the mechanical friction of raw bones rubbing against each other. What are the different types and causes of arthritis? Osteoarthritis or Degenerative Joint Disease are the most common type of arthritis. Osteoarthritis is also known as “wear and tear arthritis” since the cartilage simply wears out. When cartilage wears away, bone rubs on bone causing severe pain and disability. The most frequent reason for osteoarthritis is genetic; the durability of each individual's cartilage is based on genetics. Trauma can also lead to osteoarthritis. A bad fall or blow to the knee can injure the joint. If the injury does not heal properly, extra force may be placed on the joint, which over time can cause the cartilage to wear away. Inflammatory Arthritis, which causes swelling and inflammation of the joint lining, releases enzymes which soften and eventually destroy the cartilage. Rheumatoid arthritis, Lupus, and psoriatic arthritis are diseases that are inflammatory in nature. What are the predisposing factors to osteoarthritis of the hip? Inactive lifestyle, which can cause obesity (overweight). Your weight is the single most important link between diet and arthritis; being overweight puts an additional burden on your hips, knees, ankles and feet. 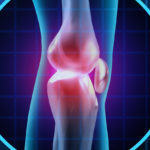 What are the predisposing factors to osteoarthritis of the knee? Abnormalities of knee joint function resulting from fractures of the knee, torn cartilage and torn ligaments can lead to degeneration, many years after the initial injury. These mechanical abnormalities lead to excessive wear and tear – just like the out-of-balance tire on your care that wears out too soon. There are more than 100 different forms of arthritis and symptoms vary, depending on the form. They also affect the body differently. Arthritic symptoms generally include swelling and pain or tenderness in one or more joints for more than two weeks; redness or heat in a joint; limited motion of a joint; early morning stiffness; and skin changes, including rashes. Doctors diagnose osteoarthritis with a medical history, physical exam and radiographs. At times advanced imaging may be necessary. There is no blood test for osteoarthritis. Consult a doctor who will determine the type of arthritis you have and will recommend further specific treatment plan. Take anti-inflammatories, as recommended by your doctor. Participate in regular low impact exercise. If you have arthritis – are diet and nutrition still such a simple matter? These are the questions that people with arthritis often ask, and they’re valid questions. Some questions (Can what you eat cure your arthritis?) have simple answers (No). Some questions (Are there foods that can cause your arthritis to ‘flare’ or go into remission?) aren’t so straightforward (Perhaps…). Most of what you need to know about diet and nutrition is common sense; healthy eating is pretty much the same for anyone, whether you have arthritis or not. But talk to your physician to discuss the latest advances in treating arthritis, and to determine if changing your diet could help ease your symptoms. An unloader knee brace is a non-surgical way to address pain caused by knee osteoarthritis.